Every weekend we dig into the archives. This post by Matt was originally published in June 2014. 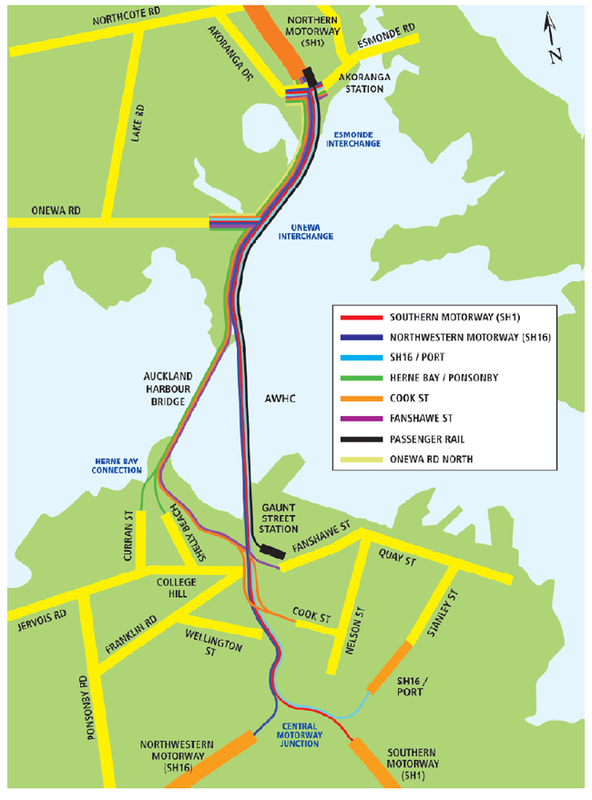 Last week there was some renewed debate over the merits of the Additional Waitemata Harbour Crossing (AWHC) project, due to former Local Government Minister Michael Bassett suggesting it should start nearly immediately and made a lot more sense than the City Rail Link. I outlined why that particular argument is complete rubbish previously, but I think it’s worth delving back into exactly why AWHC is an unnecessary, wasteful, counter-productive and completely stupid project. For the purposes of this post, I’m talking about the AWHC project’s roading components as proposed in quite a lot of detail here by NZTA. This is a debate that’s going to get much more intense later this year as the NZTA is getting ready to apply for a designation for the project. This is what they have said about it. The NZ Transport Agency expects to progress the designation to protect the route of the planned additional Waitemata Harbour Crossing later this year. The Transport Agency anticipates that there will be a public hearing regarding its designation request in mid to late 2015. Let’s work through each point one at a time. Firstly, in terms of traffic volumes we have extensively documented the number of vehicles travelling over the Harbour Bridge has been very static for a number of years now and remains below 2006/07 levels. This is significant because the NZTA’s business case for the AWHC project (which suggested a cost-benefit ratio of about 0.3) assumed significantly higher traffic levels than what’s actually occurred. Also notable is that the modelling was done two years after the 2008 starting point yet used the models results which were significantly higher than what had actually happened. A case of rewriting history. 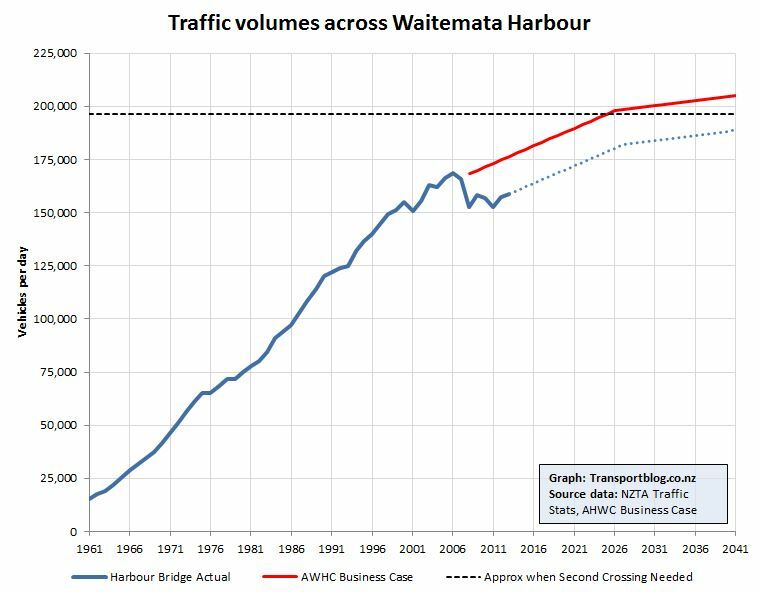 We know that generally traffic growth has been minimal over recent years, but what makes NZTA’s analysis particularly bad is that the impact of the Waterview Connection project – completing the Western Ring Route which has the very purpose of taking pressure off State Highway 1 including the Harbour Bridge – seems to have been ignored in the projections. So therefore not only has traffic demand over the Harbour Bridge been steady for the last few years, there’s actually a project coming online in the next few years which is designed to reduce traffic across the bridge. In the (much) longer run, traffic volumes may increase again – but then again the North Shore rejected major intensification as part of the Unitary Plan so perhaps longer term growth won’t be as significant as in other parts of Auckland. The growth that does occur is more likely to be from the upper areas for whom the WRR is a more viable option should they need it. Further as people who use the bridge daily will attest, it’s not the bridge that is congested but the approaches. The Northern Motorway is notoriously congested at peak times and I think much of the local support for AWHC is based off the assumption that it will fix this congestion. Unfortunately for the locals, it appears unlikely that this will occur – even after spending $5.3 billion. One of the reasons for this is simply how the AWHC will connect back into the existing network. The current plan is the new crossing would hook directly from the Northern Motorway on the Shore through to the Central Motorway Junction in the City. People going to the city would use the existing bridge. In short the AWHC doesn’t provide any extra traffic capacity for through movement however what it does do is allow for a lot more capacity to the CBD. All current plans are focused on trying to reduce traffic in the city centre so this goes against everything else we are trying to achieve. In addition any increases in capacity are also going to place additional pressure on the local roads of the North Shore. Quite how the planners and engineers plan to deal with that is is unclear. Some like to argue that by building the AWHC it will allow for the current lanes on the bridge to be turned over to buses, walking and cycling however that means we are spending over $5 billion for little or no gain in capacity. That seems insane to me. We can also see in the modelling from the City Centre Future Access Study – which crazily included the AWHC as a reference case project – that the new crossing will be just as congested as the existing one. The two images below are from the modelling in 2021 and 2041 and show both crossings at 80-100% of capacity during the peak so for those on trips past the CBD there is little to no difference in the amount of congestion they will experience. Of all the arguments for the AHWC this is one of the stronger of them however even it falls over very quickly. The NZTA have said the clip-ons could last many decades longer, especially if heavy vehicles were restricted from them like what happened a few years ago while they were being strengthened. Now those forecasts are the same ones mentioned earlier which have assumed massive ongoing growth which simply hasn’t been happening and the NZTA don’t really have a good handle of just what impact the completion of the Western Ring Route will have. It seems to me that we shouldn’t even be having a discussion about timing for the AWHC till about 2020 so we can see whether traffic volumes increase once again and what impact the WRR has. Further I think there’s a way to replace the clip-ons without a new road crossing, more on that soon. I think it is critical that we build resilience in our transport system however I question whether effectively duplicating existing infrastructure is the best way forward. To me that will simply shift the issue to the next weak point on the network. To explain this let’s work through a few scenarios assuming we have the AHWC as described above, these could be anything from a broken down vehicle to something catastrophic. The existing Harbour Bridge – as traffic to/from the city is unable to access the AWHC from Fanshawe St/Cook St then the only option would be to use Grafton Gully and the connection to SH1 from there. Put simply there is no way that single connection could cope and in the process would see huge numbers of vehicles clogging up the city centre as well as congestion likely through the isthmus parts of the motorway network. In either scenario traffic would also be able to use the upper harbour bridge. Not as many people are directly affected should something go wrong. A perfect example of this in action comes from San Francisco. In the 1989 earthquake part of the Bay Bridge collapsed cutting off an important connection between Oakland and San Francisco. Like Auckland there were other bridges available to get across the harbour but in many cases they represented a significant detour and likely experienced heavy congestion as a result of the traffic diversion. Thankfully for San Fran they also had another crossing of the harbour and one that wasn’t impacted by congestion on other parts of the road network – their BART system. That provided both a high capacity alternative to the road network and many people quickly changed their travel patterns. Interestingly after the bridge reopened a month or so later many of the new users enjoyed using the system so much they continued to keep doing so. To me none of the arguments stack up for building another road crossing any time within the next few decades. This is exaggerated by the sheer cost of the project which at a stated $5.3 billion is far larger than any other transport project proposed in NZ to date. In comparison the current largest single project is the Waterview connection currently under construction for a price tag of $1.4 billion. In the next post I’ll cover what I think we should do to improve connections across the harbour. Yes, rail & active mode should definitely be the next crossing here. Yes Grant, you get it, I get it, and it seems that most of Auckland gets it. The only ones that don’t seem to get it are NZTA and AT. Why is there $60 million allocated for route protection work still? Where is all the extra traffic going to head on either side of a new road crossing? What about increased carbon emissions from more vehicles? If someone thinks that the answer to carbon emissions is simply to replace fossil fuel cars with electric ones then the problem of congestion still remains; and the more that is spent on building more roads to address this, the less there is to develop better PT options i.e. the status quo. I wonder where the visionary leader is going to come from to pull Auckland out of the current hole? No options appear at the moment. A rail and active mode crossing also requires route protection. yes so lets spend that $60M on protecting a route for the rail crossing instead. Where are all those extra vehicles going to park once they get into town. There’s no where for them to park now, and any land that could be used for parking is rapidly being filled by buildings. A road crossing will prove to be as ineffective as the Waterview Tunnel has been in the west. As the Herald article above states, only a year since opening and travel times have increased markedly. The real tragedy is all the spending on roads comes at the expense of PT projects as money is only a finite resource. The money spent on a rail crossing would fund a light rail crossing as far as Albany and at least one of the two light rail proposals currently under development. Yes I know you are going to tell me that this won’t happen for 5.6 billion, but neither will the AWHC. Takapuna is already earmarked for a flyover to connect to the motorway and frighteningly traffic assessments for traffic leaving the motorway has not been done, at least not when I last asked. This project makes even less sense than it did in 2014. Do you think the editors insisted on the incongruous title of that article? I wonder where the many concurrent offsetting national road speed limit reductions on high-risk roads are happening? Regardless of anyone’s position on what speed that piece of motorway should be, do we want transparency in the follow-through of commitments AT makes? Who knows Heidi, but the facts are out there to show the folly of huge spending on roads that fixes nothing. I am curious about the NZTA project approval process and the BCR for this project. So is this project actually “approved”? It would not qualify on economic grounds given the BCR. The previous planning process was under the prior governments RONs program. Would the second crossing match the planning criteria in the new GPS? If not, does this project actually have a mandate to do anything more than further investigation? If it was approved, are there grounds to revisit that given what we now know about the effects of induced traffic and the outcome from Waterview? In short, is Auckland really stuck with this turkey? -it does not reduce adverse effects on the climate, local environment or public health (through the extra local roads required to lead to it, and the induced traffic, it will be harmful on the local environment, and the induced traffic will have extra adverse effects on the climate and public health). With a “low” results alignment, the project can only achieve one of the three lowest priority ratings (7, 8 or 9), regardless of the bcr. Given the number of projects that will receive priority ratings 1 to 6 due to their ability to address safety issues (we have huge opportunities here) this project should never manage to get anywhere near funding. And of course it will receive a “low” bcr if they model the traffic properly, putting it at lowest priority, labelled “Exclude”. The real question is if they can justify ANY further money being spent on investigation. I don’t believe they can. Thanks. So that is the crucial question, “does the AHWC have funding approval” or not? Surely that should be a public piece of information. Can we find out? Perhaps to answer my own question the project history and status is described here. It has consenting approval and investigation is approved. I am not seeing anywhere that funding is approved. Yes, it says the next stage is route protection, then detailed business case. The funding approval would have to follow that. It seems there should be a short-circuit option for projects that are going to receive a low results alignment; why waste our money? Exactly. $60 million may be peanuts by new motorway standards but you could deliver some bikeway or rural safety improvements for that amount of cash. Yet it is classified as a road improvement project, and they appeal to The Belief: “Ease congestion and improve travel times for motorists and freight.” The Post Implementation Reviews suggest otherwise. The Productivity Commission suggests otherwise. And of course, the engineering literature makes it quite clear that this belief is a myth. But let’s watch as NZTA use public transport and active mode infrastructure as the sweetener that will get the roading aspects to happen, when those roading aspects will be absolutely damaging for Auckland’s form, transport network, safety and liveability. This is a great opportunity to show us, Ministry and NZTA, that we don’t need to be cynical about the methods used to serve the road construction lobby at our expense. Anyone care to explain why buses use the clip-ons almost exclusively? They generally enter and exit the motorway on the left relatively close to each side of the bridge. I can see why they wouldn’t want to undertake a number of lane changes in a large vehicle in a short distance. I wonder whether provisions of the Zero Carbon Bill will seek to reign in projects that cause increasing carbon emissions. It is apparent that the government wants to reduce stock numbers in the agricultural sector, but surely every industry that pollutes should pay the price? Say for example a shopping centre with 5000 car parks; is the retail industry any more important than agriculture and shouldn’t the shopping industry pay a carbon tax? I will certainly be submitting that it should.